Alejandro Jodorowsky and Unbox Industries announce a series of statues based off his cult films. ABKCO Films a division of ABKCO Music & Records, Inc. and Unbox Industries are proud to announce a series of licensed limited edition figurines based on the film works of one of the world's most controversial and provocative film makers, Alejandro Jodorowsky. 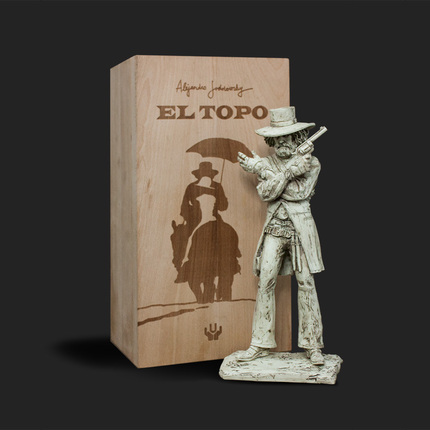 The series of four figurines are based on the characters from El Topo and Holy Mountain. There's enough interest for this seemingly very niche item to exist yet not enough interest to drum up support for a sequel? Very nice. I just can't justify spending 200 bucks on this though. Dan, thanks for the content--but honestly this just seems like a press release. You work for Unbox, don't you? Or am I mistaken? If I'm not, can you please refrain from posting things with a personal commercial agenda? It borders on spam. Thanks. Turns out he is a designer there.